More and more of us are traveling with more gadgets, phones, receivers, watches, emergency beacons and of course iPods. Well they do need charging, why not have the sun do it while we are hiking. Zeal Optics introduces the RELIANT Solar Backback. A versatile, safety-enhancing, backcountry companion. A Solar Backpack which produces self supported energy and holds all your gadgets in one place. Charge all your mobile devices - Simply use the USB cable that comes with your devices. Plug it in and your device will begin charging. Perfectly works with the Zeal Transcend GPS goggle, keep all your devices charged on extended expeditions. Available in rust or stealth black. Patented photo-reactive materials made from conductive polymers & organic nano-engineered materials. Watches are cool, cell phones are for call. Suunto, makes some of the coolest and most useful watches on the market. Well their newest watch does something a bit more it gives back. In honor of the legendary mountaineer and Suunto Ambassador Apa Sherpa, Suunto launches a limited edition outdoor sports instrument, the Suunto Core Extreme Edition Everest. Celebrating Apa Sherpa’s world-record 20th summit of Mount Everest, the Core Extreme Edition Everest reflects the determination and strength of one of the world’s greatest living mountaineers. Suunto will donate a portion of all proceeds of this product to the Apa Sherpa Foundation to help support the education of the children living in the remote village near the base camp of Mount Everest. As a limited edition, Suunto is producing only 8,848 pieces of the Extreme Edition Everest to match the elevation of Mount Everest’s peak at 8,848 meters. Yes it is winter and yes you might have to start to shovel snow. One of the best exercise, it shows where you are lacking at the gym and how week your back really is. 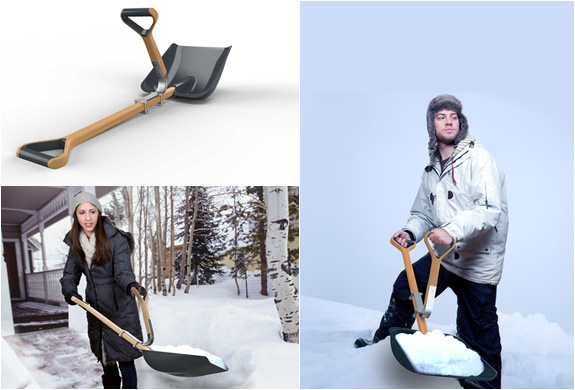 Well lets make it a little easier, it´s basically an add-on handle, very easy to install and turs your ordinary shovel into a ergonomic shovel powerhouse. After installing, your shovel has dual handles letting your arms do all the work, this takes away the pain and strain from your back. If you are skiing 60+ days a year, in some pretty harsh conditions this jacket is for you. The North Face ApoGee Jacket. Staying true to the styles of yesterday and encompassing the technology of today, the Steep Tech™ Apogee Jacket offers nearly invincible protection against winter's fury. Constructed with Kevlar®-reinforced shoulders for high-risk mountain descents, this burly jacket includes an array of technical features that athletes rely on for all-day use. Working out while working is a bonus, you have the Treadmill-Desk, which all business should at least give their employees the option to have instead of a desk and chair. Now if you are going to have a chair well, GymGym is the option. In today’s business climate, the average working adult will spend a minimum of eight hours a day seated at a desk in front of a computer. This stressful working climate is taking its toll on our health and well being. The inactivity of remaining in a seated position throughout the day causes our muscles to weaken, our bones to thin and our limbic system (responsible for the body’s immunity to illness) to become sluggish and inefficient. Hours of sitting slows blood flow and can result in the formation of blood clots, known as deep vein thrombosis. What affects the body also affects the mind. Prolonged physical discomfort results in increased mental stress, which can disrupt concentration, inhibits creativity and negatively affects our performance. The solution? Gymygym - the world’s first ergonomic exercise chair designed for our modern lives. Ergonomics is the science of designing objects and tools to conform and work with the human body rather than against it. And while the current crop of ergonomically designed office chairs represent an improvement over traditionally designed chairs, even with adjustments, their "one size fits all" approach represents outdated technology. Because no two bodies are alike, the Gymygym’s patented flat bungee seating system is designed to specifically conform to you, the user, providing the perfect combination of give and support where you need it most while helping to eliminate the very serious physical issues caused from prolonged improper seating. Nothing beats an old school look to the ones that started this sport 25+ years ago. The boards were heavy but it really felt like you were surfing. Back of the board was either a split tail or straight and unless you were in powder it was a bear to turn. Burton teamed up with BCs Noboard crew to develop the No Fish Snowboard—a powder board designed to be used without those movement-hindering binding thingies. By using a grippy pad instead of bindings, the No Fish allows you to move around and ride like you were on a surfboard. Just like the Fish, this Burton board includes a fast Sintered WFO Vision base and responsive Powder Fly II wood core. The No Fish also uses an S-Rocker to combine standard and reverse-camber shapes for a unique ride on the white waves.